Below you fill find all funeral homes and cemeteries in or near Miami. 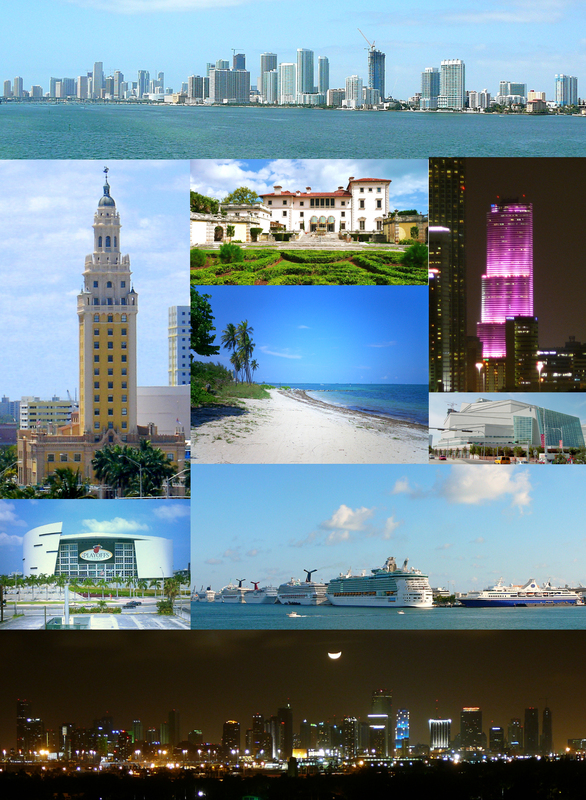 Popular neighborhoods in Miami include: Downtown Miami, Brickell, Midtown Miami, Overtown, Coconut Grove, Allapattah, Little Haiti, Liberty City, Upper Eastside, Wynwood Art District, Edgewater, Little Havana, Flagami, Model City, Bay Point Estates, Miami Design District, Government Center, Miami Jewelry District, Morningside, and Watson Island. "In 1934, E.W. Obermiller founded Flagler Memorial Park in the heart of Miami, Florida. The 32-acre cemetery was designed as place for the living, as well as for their loved ones who have passed away. We moved to the beautiful city of Plantation and founded the funeral home in 1965. Since then we have grown along with the community and now all four of our children are active in the business, two as funeral directors and two as office personnel. Suburbs of Miami: North Miami Beach, Perrine, Quail Heights, Doral, Olympia Heights, Sweetwater, West Miami, N Miami Beach, Cutler Ridge, Miami Lakes, Nmb, Olympia Hgts, Aventura, Biscayne Park, Coconut Grove, Country Lakes, Cutler Bay, Hialeah Gardens, Palmetto Bay, Richmond Heights, C Gables, Carol City, Coral Gbls, Doral Branch, El Portal, Fisher Island, Gables, Hialeah Gdns, Hialeah Lakes, Medley, Miami Springs, Ojus, Pinecrest, Town & Country Postal Store, Uleta, Univ of Miami, University of Miami, Village of Palmetto Bay, Village of Pinecrest, Air Mail Facility, Bal Harbour, Barry University, Bay Harbor Is, Bay Harbor Islands, Brickell, Carl Fisher, Coconut Gr, Coral, Crossings, Dr Martin Luther King Jr, Father Felix Varela, Flinternational Univ, Florida International Univ, Florida Power & Light Co, Gables by the Sea, Golden Beach, Goulds, Ind Crk Vlg, Indian Creek, Indian Creek Village, International Service Center, Keystone Islands, Ludlam, Mia Shores, Mia Shrs, Milam Dairy, Morales Discount Pharmacy, Normandy, Normandy Isle, North Bay Village, North Bay Vlg, Opa Locka, Palm Springs North, Pinecrest Postal Store, Seybold, Snapper Creek, South Miami Heights, Sunny Isl Bch, Sunny Isles, Sunny Isles Beach, Sunset Island, Surfside, Venetian Islands, Virginia Gardens, Virginia Gdns, West Dade, Westchester. Miami is also known as: MIA, 305 and Miami-Dade County / Miami city. Their current mayor is Mayor Tomás Pedro Regalado. Zip codes in the city: 33010, 33011, 33012, 33013, 33014, 33015, 33016, 33017, 33018, 33054, 33055, 33056, 33101, 33102, 33109, 33111, 33112, 33114, 33116, 33119, 33122, 33124, 33125, 33126, 33127, 33128, 33129, 33130, 33131, 33132, 33133, 33134, 33135, 33136, 33137, 33138, 33139, 33140, 33141, 33142, 33143, 33144, 33145, 33146, 33147, 33149, 33150, 33151, 33152, 33153, 33154, 33155, 33156, 33157, 33158, 33159, 33160, 33161, 33162, 33163, 33164, 33165, 33166, 33167, 33168, 33169, 33170, 33172, 33173, 33174, 33175, 33176, 33177, 33178, 33179, 33180, 33181, 33182, 33183, 33184, 33185, 33186, 33187, 33188, 33189, 33190, 33193, 33194, 33196, 33197, 33199, 33222, 33231, 33233, 33234, 33238, 33239, 33242, 33243, 33245, 33247, 33255, 33256, 33257, 33261, 33265, 33266, 33269, 33280, 33283, 33296, 33299. There are currently 73 funeral options for this city. Miami has been featured in films like: Public Enemies (2009), Midnight Cowboy (1969), The Anchor Hotel (1996), and Gangsters At Large (1996). Some of the notable people born here have been: Winston E. Scott (pilot and astronaut), Perez Hilton (writer and actor), William H. Macy (actor and voice actor), Catherine Keener (actor), Alexa Vega (actor and singer), Eva Mendes (actor and model), and Diora Baird (model and actor). Miami is home to the following sports teams: Miami Heat, Calgary Cowboys, and Miami Marlins. Miami (/maɪˈæmi/; Spanish pronunciation: [maiˈami]) is a city located on the Atlantic coast in southeastern Florida and the county seat of Miami-Dade County. The 44th most populated city proper in the United States, with a population of 417,650, it is the principal, central, and most populous city of the Miami metropolitan area, and the most populous metropolis in the Southeastern United States after Washington, D.C. According to the U.S. Census Bureau, Miami's metro area is the eighth most populous and fourth-largest urban area in the United States, with a population of around 5.5 million.Miami is a major center and a leader in finance, commerce, culture, media, entertainment, the arts, and international trade. In 2012, Miami was classified as an Alpha- World City in the World Cities Study Group’s inventory. In 2010, Miami ranked seventh in the United States in terms of finance, commerce, culture, entertainment, fashion, education, and other sectors. It ranked thirty-third among global cities. In 2008, Forbes magazine ranked Miami "America's Cleanest City", for its year-round good air quality, vast green spaces, clean drinking water, clean streets and city-wide recycling programs. According to a 2009 UBS study of 73 world cities, Miami was ranked as the richest city in the United States, and the world's fifth-richest city in terms of purchasing power. Miami is nicknamed the "Capital of Latin America", is the second largest U.S. city with a Spanish-speaking majority, and the largest city with a Cuban-American plurality.Downtown Miami is home to the largest concentration of international banks in the United States, and many large national and international companies. The Civic Center is a major center for hospitals, research institutes, medical centers, and biotechnology industries. For more than two decades, the Port of Miami, known as the "Cruise Capital of the World," has been the number one cruise passenger port in the world. It accommodates some of the world's largest cruise ships and operations, and is the busiest port in both passenger traffic and cruise lines. It was noted by Sarasota Herald-Tribune on March 28th, 2019 that Sylvester Joseph Britton perished in Miami, Florida. Britton was 59 years old. Send flowers to express your sorrow and honor Sylvester Joseph's life. It was disclosed on March 28th, 2019 that Tim Shook perished in Miami, Florida. Shook was 63 years old and was born in Fulton, MI. Send flowers to express your sympathy and honor Tim's life. It was revealed on March 22nd, 2019 that John Michael "Mike" Idol passed away in Miami, Florida. Idol was 66 years old and was born in Winston-Salem, NC. Send flowers to express your sympathy and honor John Michael "Mike"'s life. It was written by San Diego Union-Tribune on March 3rd, 2019 that Marianne R Boaz (Long) passed on in San Diego, California. Ms. Boaz was 67 years old and was born in Miami, FL. Send flowers to express your sympathy and honor Marianne R's life. It was written on March 3rd, 2019 that Joshua Michael Lewis died in Miami, Florida. Lewis was 49 years old. Send flowers to express your sorrow and honor Joshua Michael's life. It was reported on February 20th, 2019 that Margaret Cross (Rhoden) passed on in Bristol, Tennessee. Ms. Cross was 87 years old and was born in Miami, FL. Send flowers to share your condolences and honor Margaret's life. It was written by Cortland Standard on January 24th, 2019 that James W Willis passed on in Cortland, New York. Willis was 91 years old and was born in Miami, FL. Send flowers to express your sympathy and honor James W's life. It was reported on January 13th, 2019 that Michael Peter Recht passed on in Miami, Florida. Recht was 62 years old and was born in Oak Park, IL. Send flowers to express your sorrow and honor Michael Peter's life. It was disclosed on January 11th, 2019 that Brenda Kay Conroy (Stelk) passed on in Miami, Florida. Ms. Conroy was 62 years old. Send flowers to express your sorrow and honor Brenda Kay's life. It was written on January 6th, 2019 that John Edward II Hughes perished in Miami, Florida. Hughes was 80 years old and was born in Chicago, IL. Send flowers to share your condolences and honor John Edward II's life. When looking for funeral homes in Miami, iMortuary has everything you need. We cover Miami funeral homes as well as all and any funeral home in Miami. Also covered are funeral planning, cremation providers and funeral services. We can even send funeral flowers to any Miami funeral home for any funeral arrangement. Browse or search for funeral parlor services to cover any of your Miami funeral planning needs. In this time of need, let iMortuary be there to assist you for any funeral related service. Miami, Florida, with its Art Deco architecture, bright colors and flashy South Beach is only a part of this wonderful city. Americas Cleanest City is ranked for its clean air quality, streets, water and green spaces. A cultural melting pot, Miami is also the Cruise Capital of the World as the number one cruise passenger port in the world with the largest cruise ships and the busiest passenger traffic and cruise lines. Miami is also the richest city in the United States and ranked as the fifth-richest in the world. The official website for the city of Miami is http://miamigov.com. A directory listing of funeral home companies in Miami, FL and surrounding areas. Full Service Funeral Home in Miami Florida, Provides funerals, cremation, caskets, urn, burials, national and international shipping of remains to other funeral homes. We work with local florists and flower shops to offer same day delivery. You will find budget sympathy flowers in Miami here. Our funeral flowers are cheap in price but not in value.